The siding comes off, and there's a message from a long time ago. This was part of a 7-up ad painted on the side of a cafe. At some point, it was covered with new siding. Now that old siding is coming off and the 1901 Cafe and the 7-up signs are visible again. 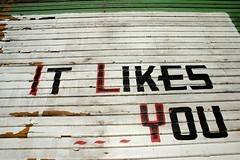 "it likes you" hmmmmm could be like a message from the netherworld. Fodder for a Steven King novel. very cool...are they going to leave the old ad? I love it when that happens. We have a lot of brick building around our downtown that have faded out adds painted on them. I think it is especially cool when ads have been painted on top of ads and you can see them both. I really like the old Coca-Cola ads painted on the buildings. Yay! As you know, I think that all new buildings should be torn down and replaced with old ones, so the reemergence of that old ad fits right in with that philosophy. I hope it doesn't get painted over with a Hooters ad or something. LOL at the Hooters ad. Worse yet would be if they tear it all down and build a Hooters! Nah....there's a Hooters just up the road...they'll put in a Starbucks since the next closest one is only a block away.